"It's a zen thing, like how many babies fit in a tire." When Waiting For Guffman originally came out in 1996, it was labeled as something of a follow-up to the 1984, smash hit comedy This Is Spinal Tap. The reason mainly being because Christopher Guest wrote much of the film, and collaborated with Tap alumni Michael McKean and Harry Shearer on the songs and music featured within. In a sense, this interpretation holds true. Where Tap took a satirical stab at the world of 1980s' heavy metal, Guffman does the same for small-town, community theater. Co-authored by comedian Eugene Levy, he and Guest (along with an outstanding comedy cast), indulged themselves in some ad-libbed and improvisational humor to construct the film with impressive results. The story takes place in Blaine, Missouri, where they are celebrating the 150th anniversary of the founding of the town. As part of the celebration, local theatre director Corky St. Claire (Christopher Guest) decides to create a musical pageant that pays tribute to the small town, entitled "Red, White, and Blaine." The film is structured like a mock documentary, following the development of the project from the casting stage to the final product. Along the way, St. Clair works with actors composed of a local dentist (Eugene Levy), a couple that runs a travel agency (Fred Willard and Catherine O'Hara), a Dairy Queen worker (Parker Posey), and various other members of the community. Each distinctive cast member brings his own personality and flair to the project, but there's just one problem: none of them are particularly talented. As a result, the musical seems sweetly flawed from the beginning, where good intentions alone may not equal a stage success. Although Waiting For Guffman is not quite as brash and goofy as something like This Is Spinal Tap, it's no less hilarious. It is more subtle, however, with most of its humor coming more from the excellent portrayals of the characters. It also strikes very close to the reality of what it's like to work in any kind of small theater troupe or performance house. Obviously the cast draws on their familiarity with these experiences on the small stage, having to arrange skits and plays. Christopher Guest was also, at one time, a Saturday Night Live cast member where he got to tune his skills at ad-libbing and goofy improvisation with the likes of Harry Shearer and Billy Crystal. When the comedians have a genuine passion for this kind of thing, it really shows, and Guffman feels like a true labor of love. Following in the tradition of most mockumentaries, Waiting For Guffman tells the story as if it were a real event, and the spontaneity of the improvisation is one of the keys. Undoubtedly, most people that see this film will already be familiar with this cast from Best In Show, Christopher Guest's most recent film that is similar in feel as a send-up of dog shows. Since Best In Show has already received a warm welcome on DVD and has already gained much more of an audience than Guffman did (thanks to more publicity), people will luckily come into this with some previous experience of the style applied here. Image Transfer Review: The anamorphic, 1:85:1 transfer is primarily without complaints. The cinematography isn't very complex, and the film stock is extremely grainy (presumably to keep the documentary feel), so some of that carries over into the image. There were no obvious problems, like artifacts or pixelation, and the print is generally clean. Colors are very lifelike and vivid, adding to the realism the film hopes to achieve. Audio Transfer Review: Waiting For Guffman is about 90% dialogue, so the audio track doesn't really have a whole lot to do. Most of the movie is rooted in the center channel, and the only stereo effects are during the musical numbers later in the film, which sound very good. There are no surround effects, however, but the track is not disappointing given the nature of the film. Nothing is harsh or inaudible, and good overall balance is maintained. Extras Review: One of the main features of the disc is a commentary track by Christopher Guest and Eugene Levy. I must say that, overall, the track is somewhat disappointing. The two don't say very much of anything (leaving long gaps without speaking), and they almost seem reluctant to discuss the movie. Even though it's a sparse commentary, whenever they do discuss things, there's usually something interesting (or funny) being said. A 33-minute reel of deleted footage is where most people should invest their time. Some various alternate takes and extended scenes (including an entire musical number) are featured, and they make a good supplement to the film. There is alternate audio for all the scenes featuring more commentary by Guest and Levy. It's a slightly better commentary than for the movie itself, but it still seems to a lack a certain amount of enthusiasm. There is a trailer, some basic cast/crew bios, and a very short bit of information on the production (labeled as behind-the-scenes) finishing things up. 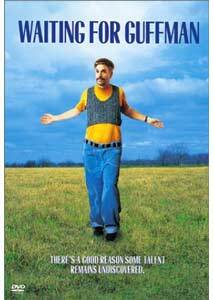 Hopefully, Waiting For Guffman will emerge from its cult-phenomena status into something that far more people can appreciate. The brilliance of the movie, for me, is that it accomplishes it's hilarity without being completely obvious about it. It pokes fun at community theater without trying to trash it, and it results in a charming experience with believable characters. We need more comedies as clever as this.